I’m sure some of you who watch kdramas are already familiar with the titles used in the family, as in how a person address his or her family members. I got used to hear a servant or maid calling the young master and miss as doryeonnim (도련님) and agasshi (아가씨) in dramas but when I watched another dramas, I was surprised to hear a woman addressing her younger brother and sister-in-law as doryeonnim and agasshi. I then realized that there are various ways of calling your relatives in Korean culture. It’s not as simple as uncles and aunts! Family is called kajok (가족) in Korean. In the family, the great-grandparents are referred to as jungjobumo (증조부모), with great-grandfather jungjobu (증조부) and great-grandmother jungjomo (증조모). The grandparents are referred to as jobumo (조부모), with grandfather jobu (조부) and grandmother jomo (조모) while parents are referred to as bumo (부모). Most of the time the suffix –nim (님) is added, for instance jungjobumonim (증조부모님), jobumonim (조부모님), and bumonim (부모님). When addressing the maternal side of the family, i.e. your grandparents and great-grandparents on the mother’s side, the prefix oe- (외) – pronounced ‘weh’ – is added, for example oejungjobonim (외증조부모님) and oejobumonim (외증조부모님). Dangshin (당신) – an affectionate term for ‘you’. Sarang (사랑) – literally means ‘love’. Seobang (서방) – an archaic term of husband, literally means ‘west room’ because husbands used to stay in the West side of the house. Nampyeon (남편) – literally means ‘husband’, used to refer the husband when talking to relatives and friends. Joo-in (주인)/Bakkat yangban (바깥양반) Joo-in yangban (주인양반) – referring to the husband when talking to other people. Aebi (애비) – referring to the husband in front of adults with children, i.e. the parents of your children’s friends. Anae (아내) – referring the wife to non-relatives. Emi (에미) – referring to the mother in front of an adults with children, i.e. the parents of your children. Boo-in (부인) – literal meaning of ‘Mrs’ and can be used either to address the wife directly or for referring the wife when talking to others. An-saram (안사람) – referring to the wife while talking to other people, literally means ‘the inside person’ since wives stayed in the inner quarters of the house back then. Your daughter’s husband/your son-in-law, addressed directly: (name)-seobang (-서방) ~literally Husband (name). Mothers between in-laws: an-sadon (안사돈); when one of the mothers is older, the younger one will address the older mother-in-law as sabuin manim (사부인 마님). Your grandaunt: wang-gomo (왕고모), gomo halmeoni (고모할머니), keun halmeoni (큰할머니), or jageun halmeoni (작은 할머니). Your granduncle: keun harabeoji (큰할아버지), jageun harabeoji (작은할아버지), or jin-harabeoji (진할아버지). When your father has several older brothers, the order is according to their age: the eldest will be keun abeoji (큰아버지), followed by duljje abeoji (둘째 아버지), setjje abeoji (셋째 아버지), etc. The same pattern applies to their wives. The pattern is also used to address you father’s uncles (your grandfather’s siblings) and their spouses, like keun harabeoji (큰할아버지) and keun halmeoni (큰할머니). However, this depends on the family. For the aunts, the keun (큰) and jageun (작은) prefixes are added according to their order in the family: the older one will be keun gomo (큰고모) or keun eemo (큰이모), and the younger one jageun gomo (작은 고모) or jageun eemo (작은 이모), regardless on whether they’re older or younger than your parents. Same goes for your older brothers and sisters, the keun (큰) and jageun (작은) prefixes are added when there are several of them. The oe/weh (외) part is dropped when you’re directly addressing your maternal family members. You also address your cousins just like how you address your siblings but when referring to them when talking with other people, the term sachon (사촌) is added, for instance sachon hyung (사촌 형), which means an older cousin brother. Distant relatives of your father, for instance your father’s male cousins are called ajusshi (아저씨). However, there are other terms that can be used although it’s not that common, for instance dangsuk (당숙), dangsukbu (당숙부), and jaejongsuk (재종숙). 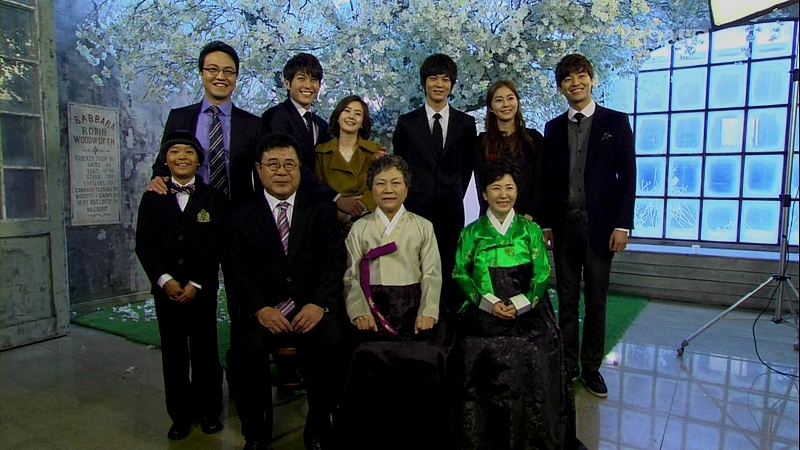 Their wives are addressed ajumma (아줌마) or ajumeoni (아주머니), dangsukmo (당숙모), and jaejongsukmo (재종숙모) respectively. When addressing your mother and father-in-law directly, you use eomonim (어머님)/eomoni (어머니) and abeonim (이버님)/abeoji (아버지). The suffix -nim is added when you want to address someone directly, except for some terms with the polite versions. I appreciate if there’s any additional point that can be added into this list 🙂 It’s pretty confusing at first but when you get the grasp of it, you’ll be having fun hearing these titles being spoken by the characters and knowing the meanings even without looking at the subs. Happy reading and hunting them in your dramas! Her sister didn’t like me calling her noo-nim because it made her feel old so I call her noo-nah. Not that it’s ever wanted, but what do you can someone’s or your ex-someone (from a divorce) or a step-someone from a remarriage? Or both! For example, I do have an ex-step-father, ex-step-sister and an ex-step-brother-in-law. (wow! That’s a mouthful!) What would I call them if if you are referring to them, through the previous (ex-) or acquired (step) relationships? I’m just so glad that the Korean family tree is not as complicated as my Chinese one. Whew! Glad I married a Korean! Great! This helps wonderfully. Not that I’ll use it regularly, it is good to know in my hopes to ever learn this language and to be able to converse with my in-laws. Any recommendations for further study? How would you address your ex husband if you had children together? The common phrase for ex-husband is jeon-nampyeon (전남편) but if you’re to address him directly (let’s name him Jaemin), you’d be calling him either by the one you used before you get married…like oppa, Jaemin-ssi, etc. Or you can also call him as your first child’s father (let’s call this kid Youngae) like Youngaeui abeoji (영애의 아버지), meaning Youngae’s father. It depends on the family practice (plus tradition) itself when it comes to the kinship terms…but I haven’t come across the term 막내 아버지. They usually use 막내 삼촌 or 계부. I found out that it’s not a problem to use 삼촌 for married younger brother of your father (because sometimes it’s a hassle to suddenly change the term for someone you’ve known all your life just because he’s married)…and you can simply call his wife 숙모.